Well, the contract work and family healthcare issues have consumed June’s workshop hours. Did manage to sneak in a few hours for fairing work here and there. And on Victoria Day in Canada, the intrepid Stephen Marcoe picked up our mast near Toronto and headed west. The stick is close now, about 250 miles away in northern Cal. Stay tuned for more on that. And for those who are smart enough to buy a finished boat, Stephen has a great one up on eBay right now. Check out the Contour 34 Trio listing. This is the finished product of the spinnaker pole mounting base. The big aluminum tangs extend four inches in to the bow with a bunch of reinforcement webs in there. I think I’ll make the pole out of carbon instead of the original aluminum plans. 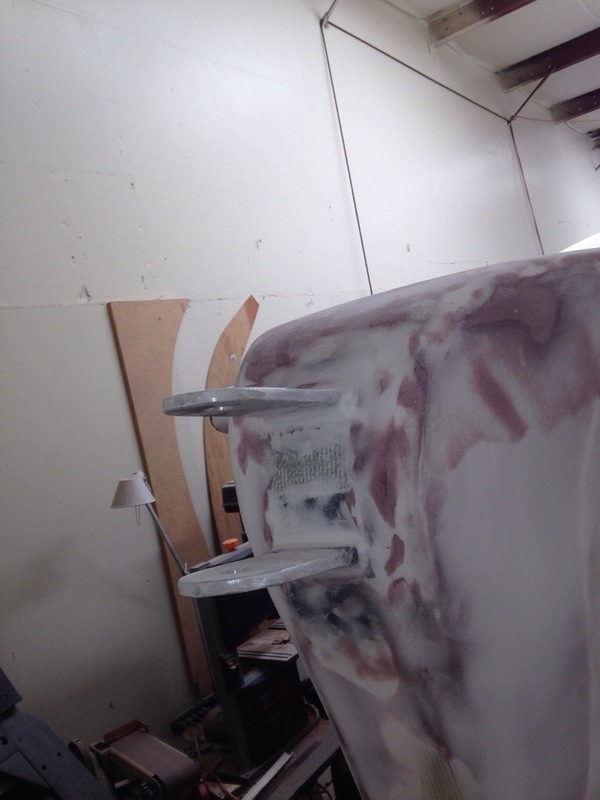 The daggerboard is finally done and it was a great way to really learn proper longboard fairing. That exercise should make the below-the-waterline hull fairing go much better. Board photos will come after some primer is applied this weekend. We’re quite happy with the final shaping. It’s good to be back at the boat work. Onward and upward towards the launch. This entry was posted in Deck & fittings by cartersboat. Bookmark the permalink. Glad to know you are back home.